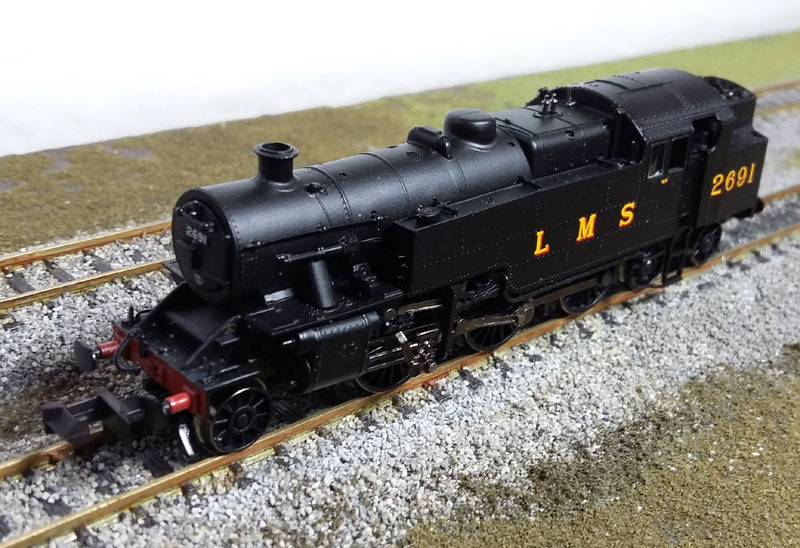 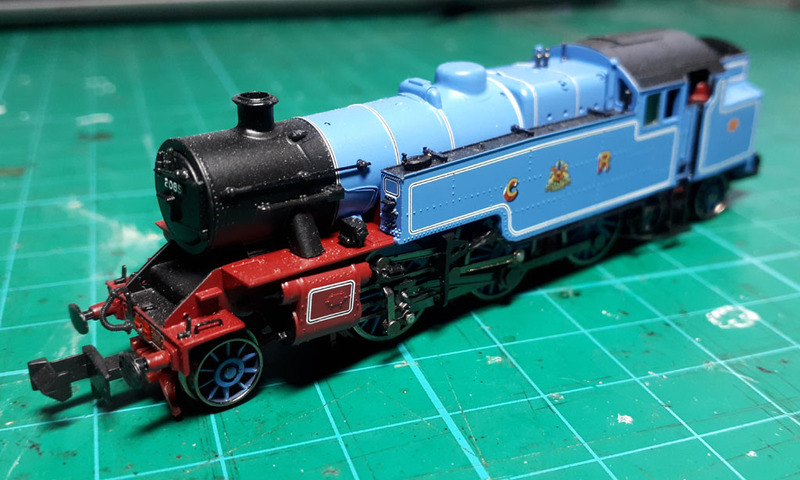 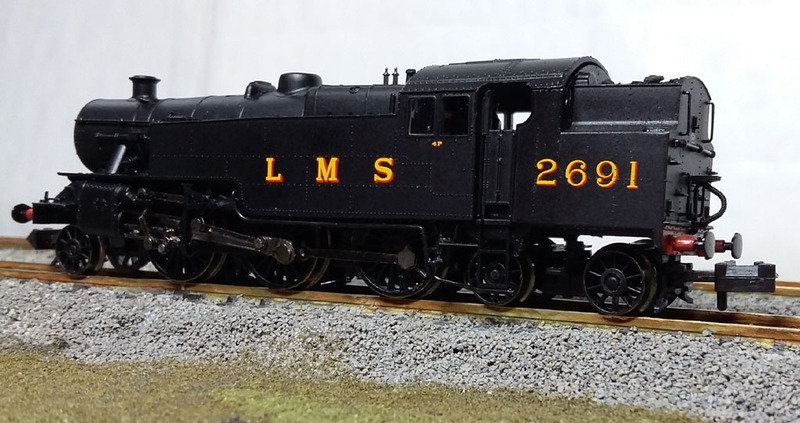 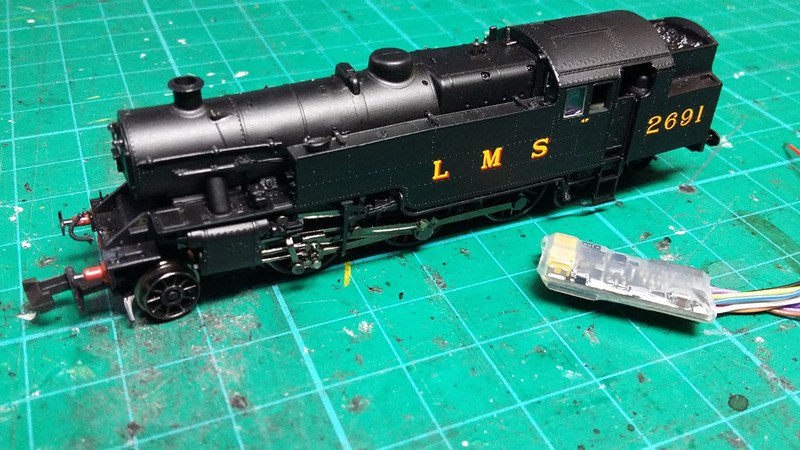 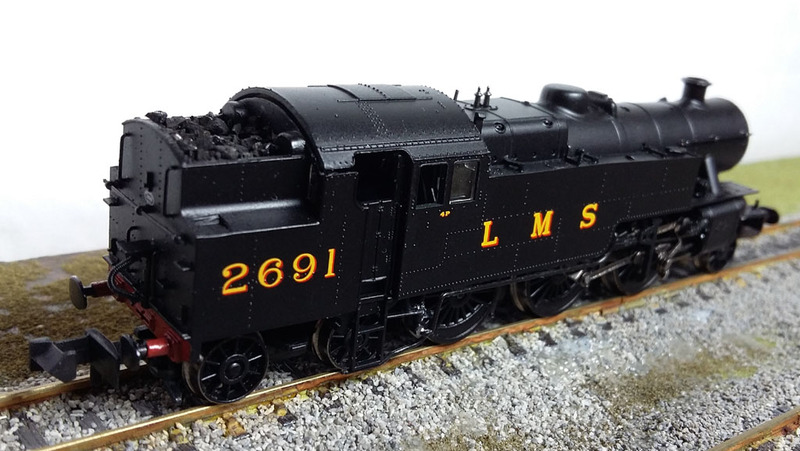 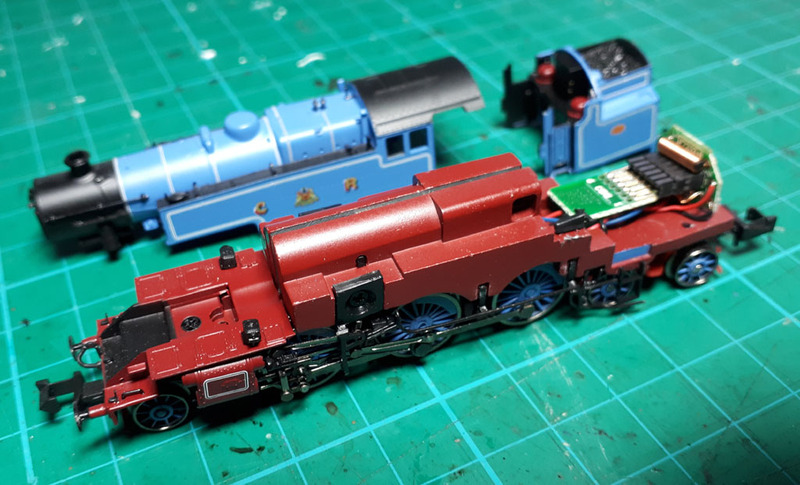 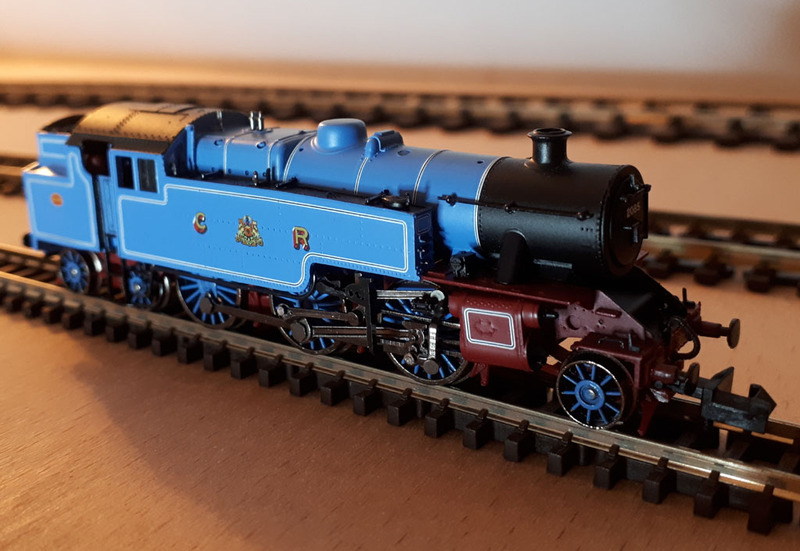 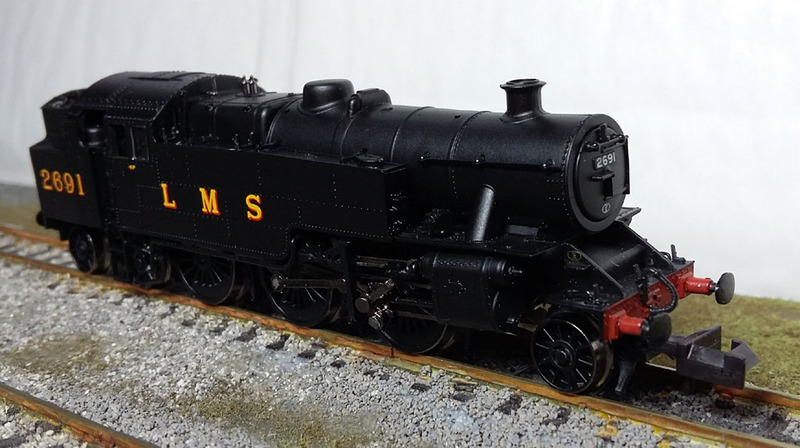 The Fairburn Tank has always been one of my personal favourite locomotives, and the Farish N gauge model is a lovely recreation. 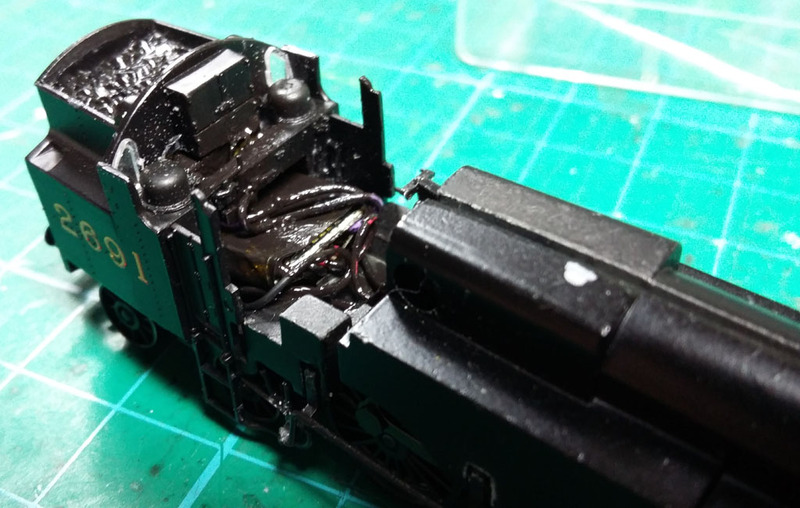 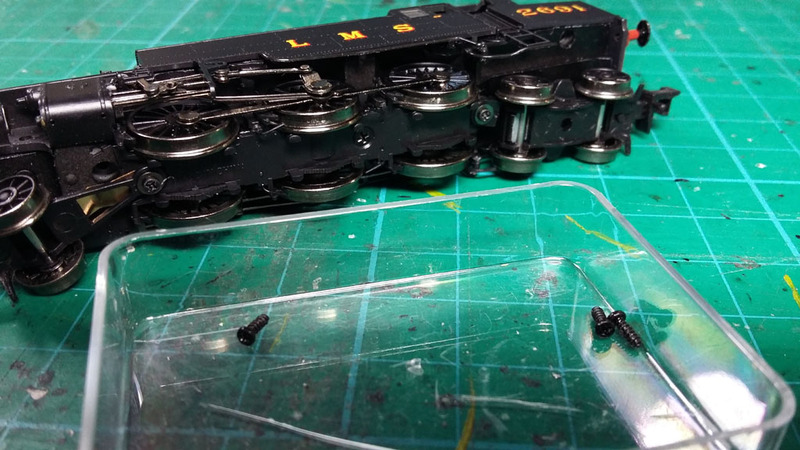 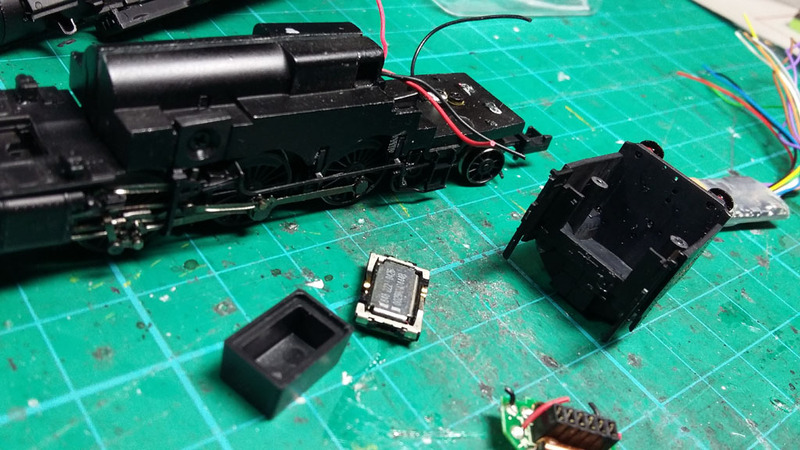 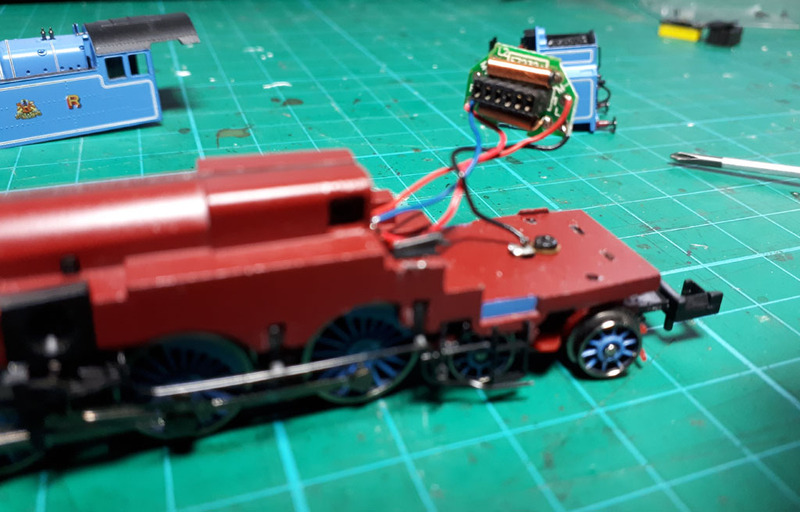 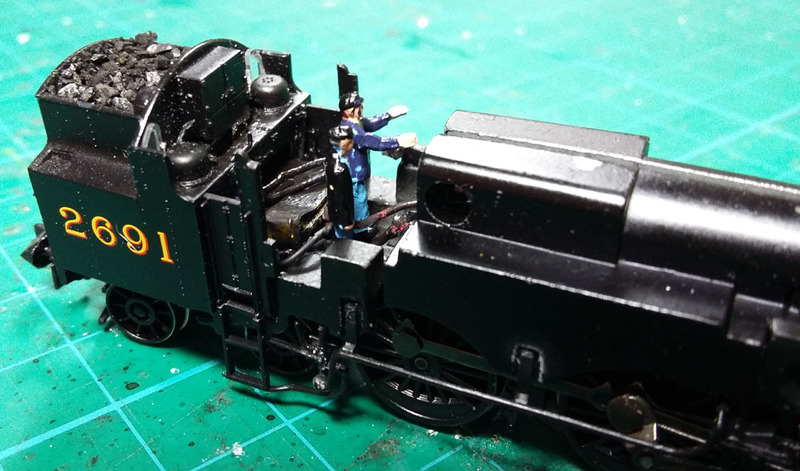 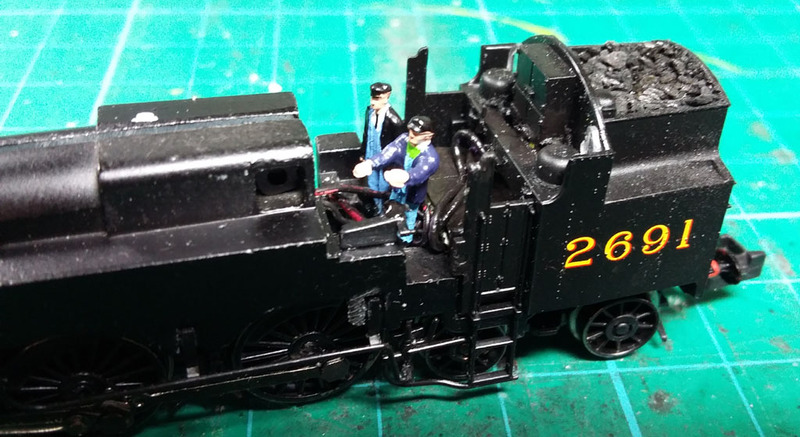 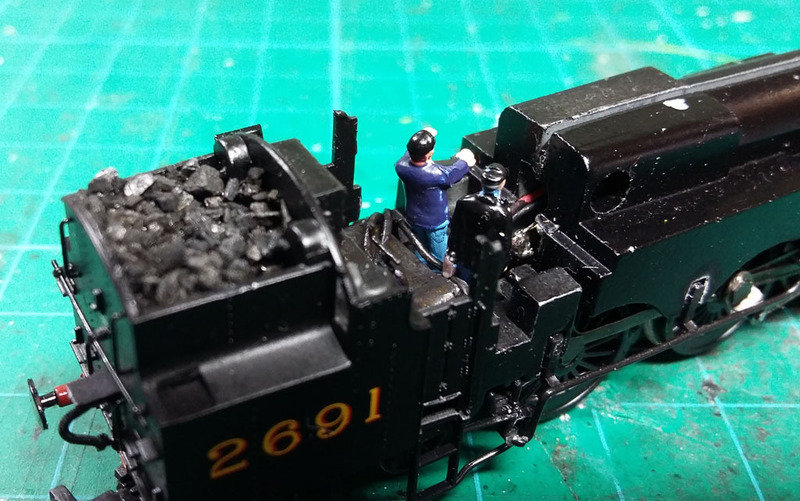 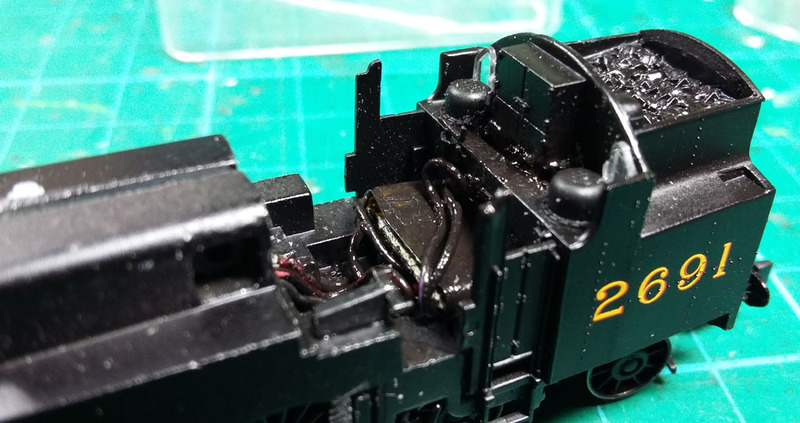 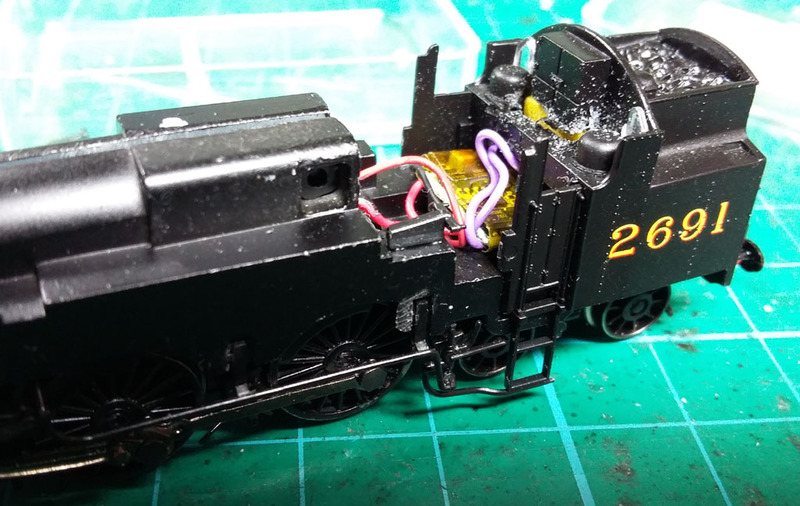 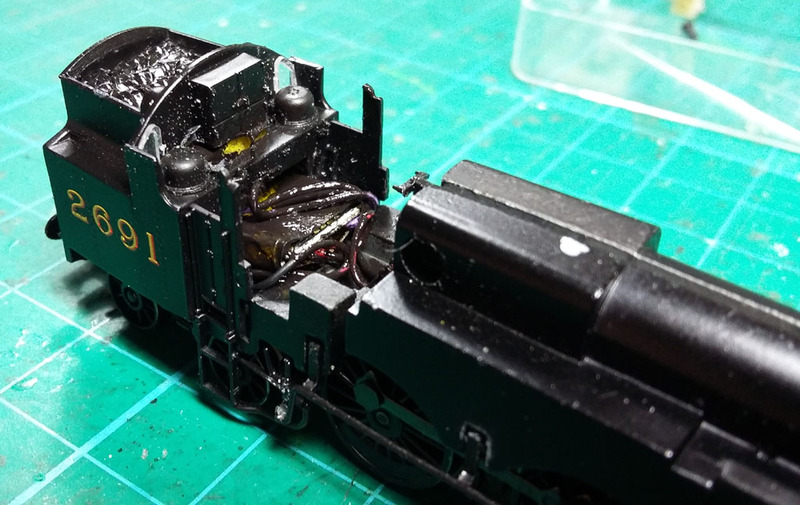 The boiler and cab top lift off after removing just the front screw underneath the front bogie, and the cab/bunker come off easily after removing the pair of screws toward the back. 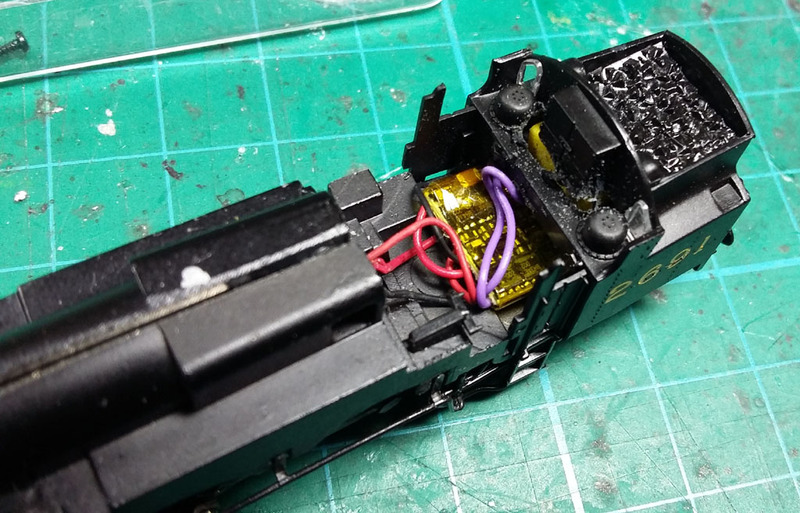 Inside we find a 6pin DCC socket and a fair enough of space inside the cab and bunker area. 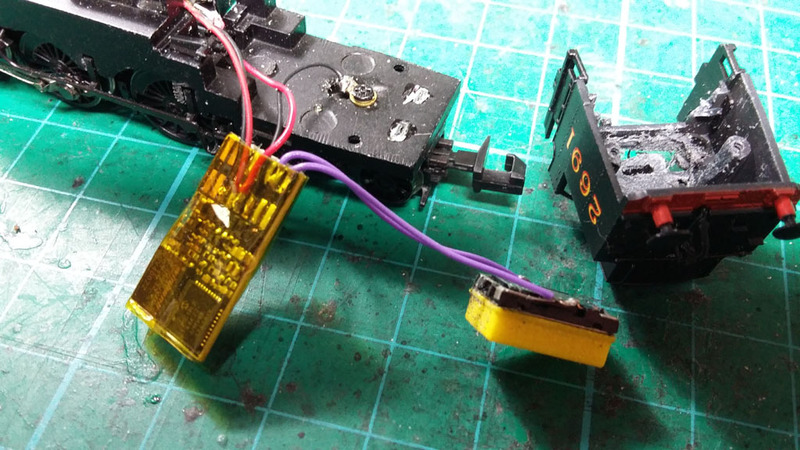 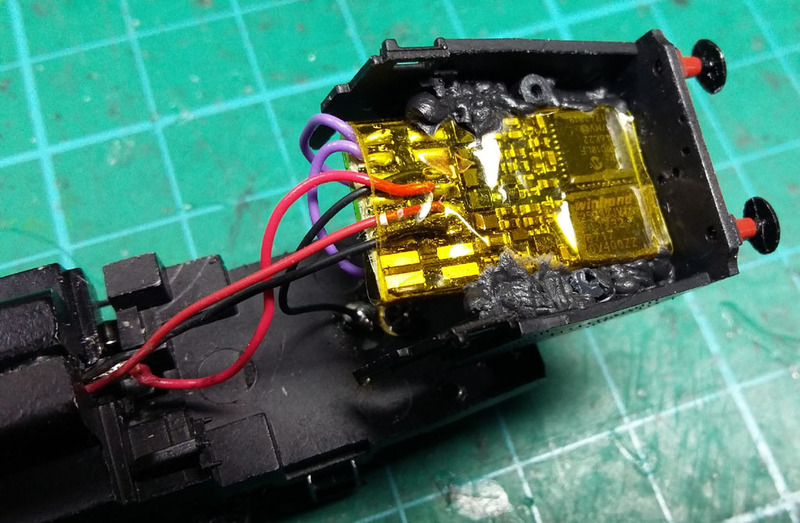 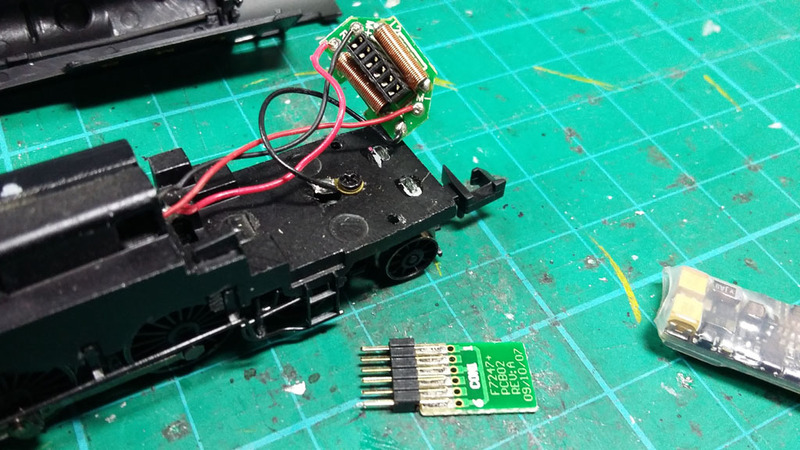 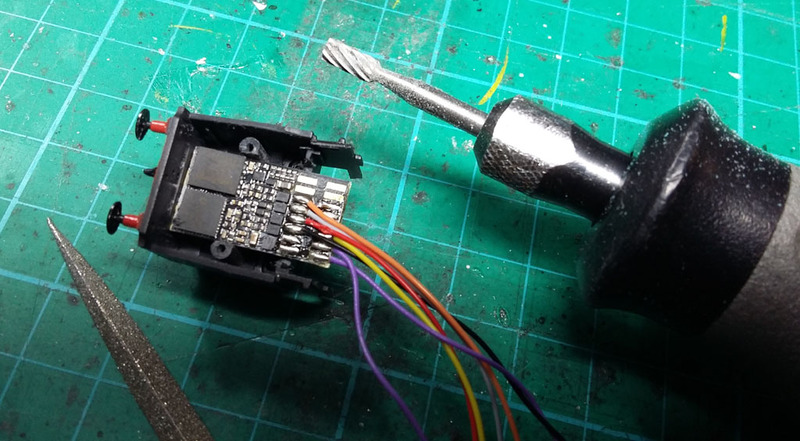 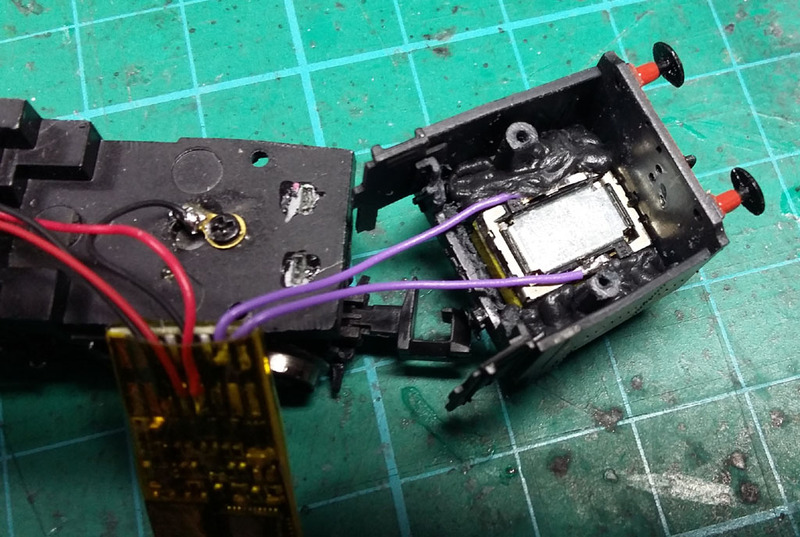 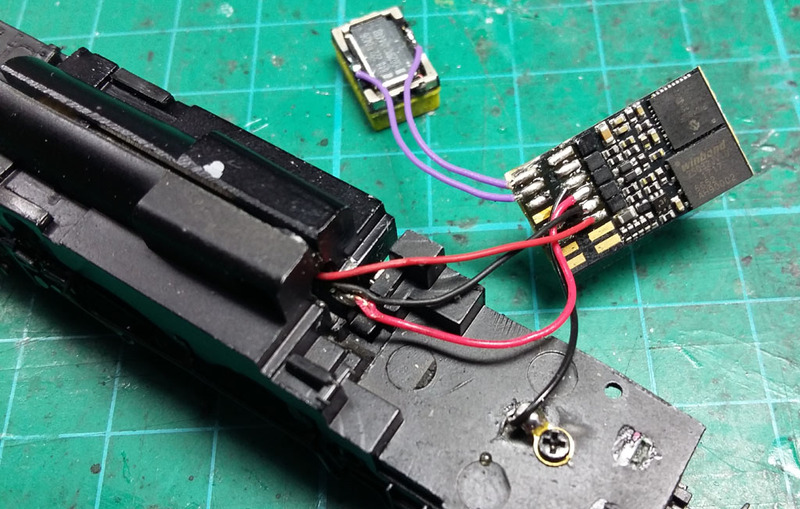 The 6pin PCB simply unslots from the chassis, so we snip off the 4 wires as we can going to lie the MX648 sound decoder essentially along the chassis floor into the bunker with a MicroCube speaker tucked up into the bunker, leaving the cab itself mostly clear. 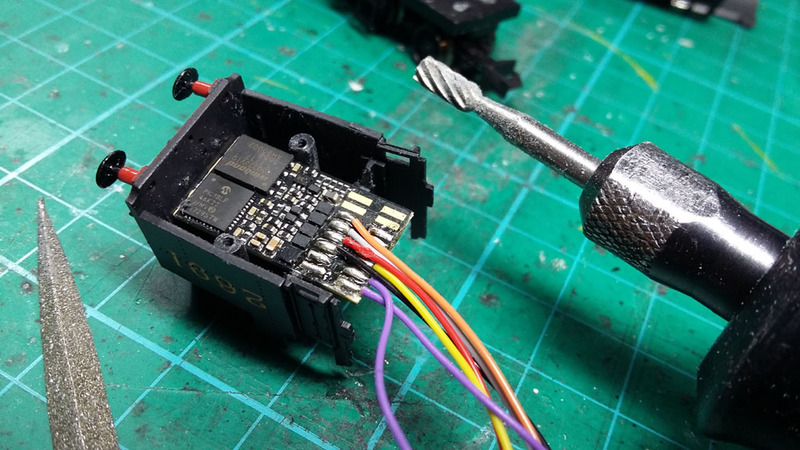 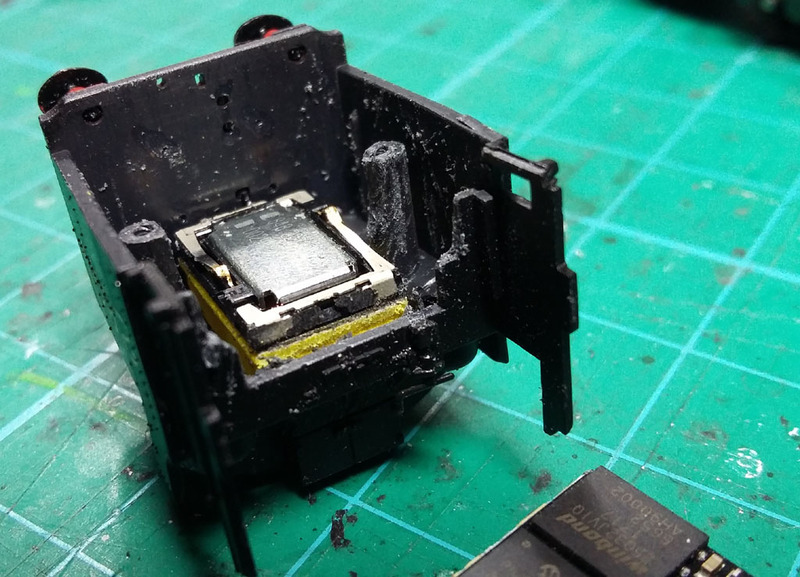 The MX648 is too wide to fit between the screw pillars, so we first remove the protective sleeve around the decoder, and carefully trim a little bit of the insides of the pillars until the decoder slots comfortably between. 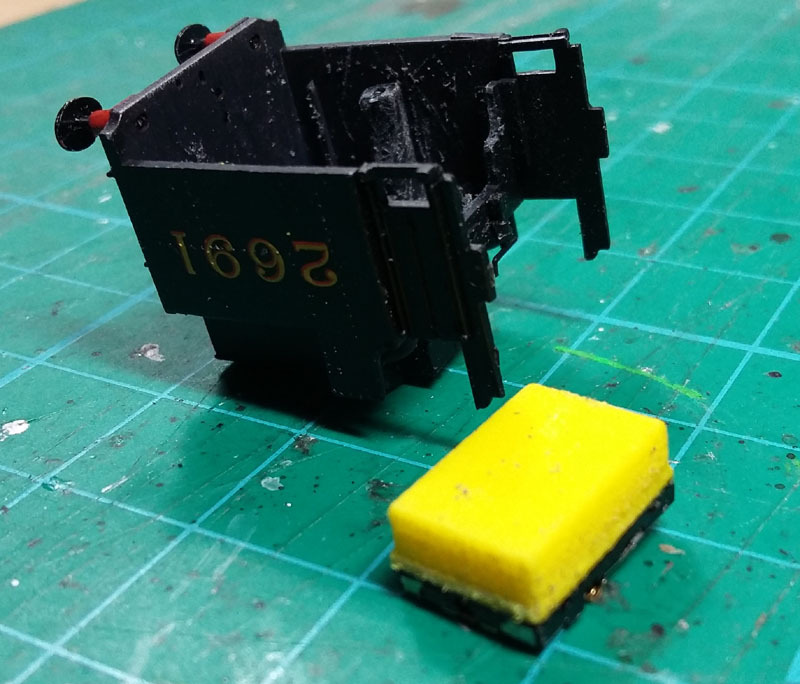 We also have a little milling to do in the bunker on the cab end so that the MicroCube6 can slot down neatly between the pillars, low enough that the decoder will sit on top and still be clear of the bottom of the pillars. 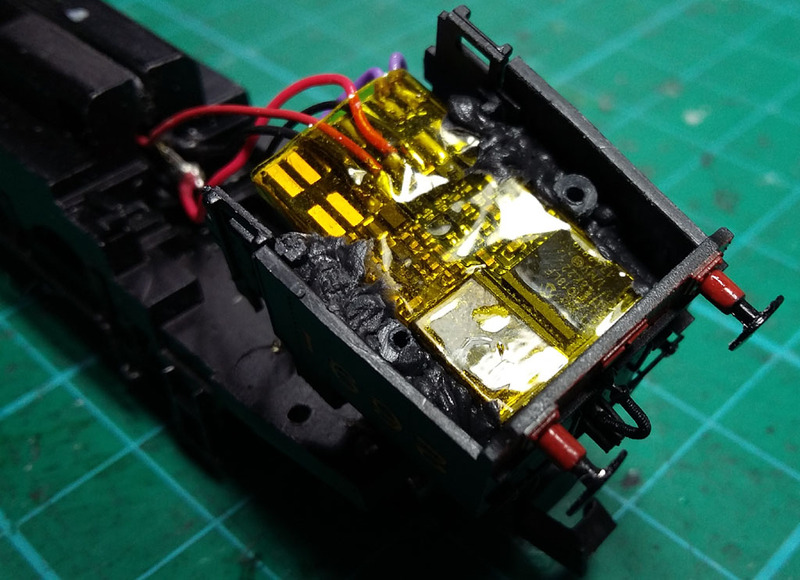 Now we are happy that it will all fit, we cover the decoder in Kapton tape, wire everything up (we removes all wires from the decoder and soldered the model's wires direct to the appropriate pads on the decoder - we don't want any wiring joins, as they would take up valuable space that we don't have! 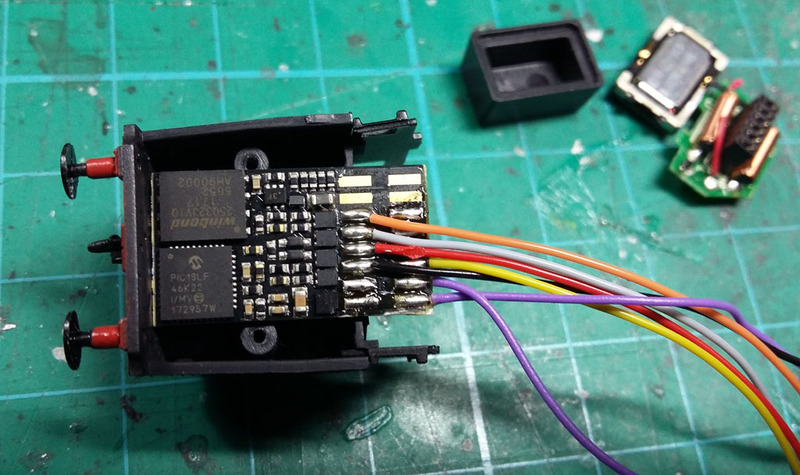 Put the speaker into position and pad out with Black Tack - this holds nicely and avoids any permanent glue being required. 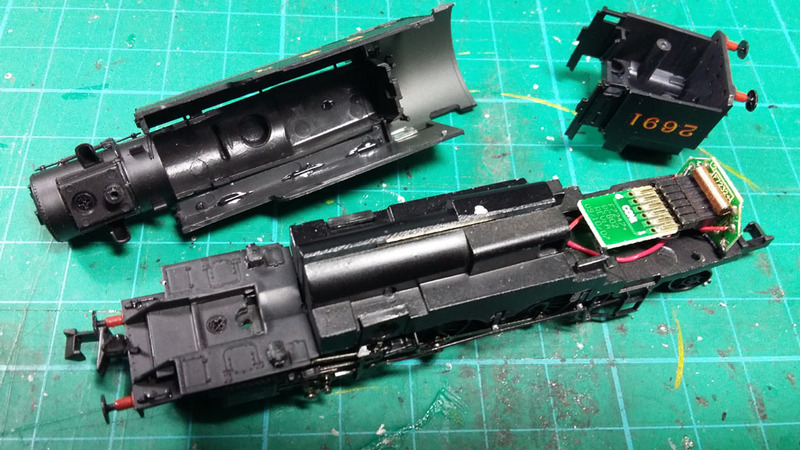 The decoder then goes in next, again secured with Black Tack, and flipped over, the cab and bunker should slot neatly into place, secured by the 2 screws underneath. 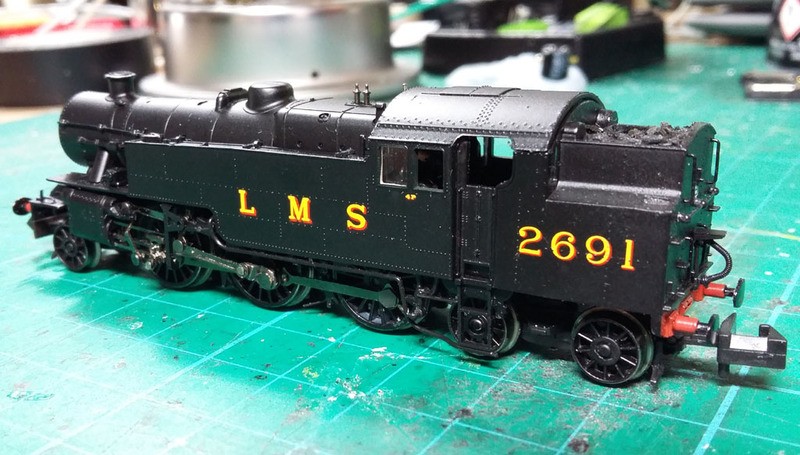 A touch of black paint where colours show through, and touch up with a little more later to make sure it is properly hidden. 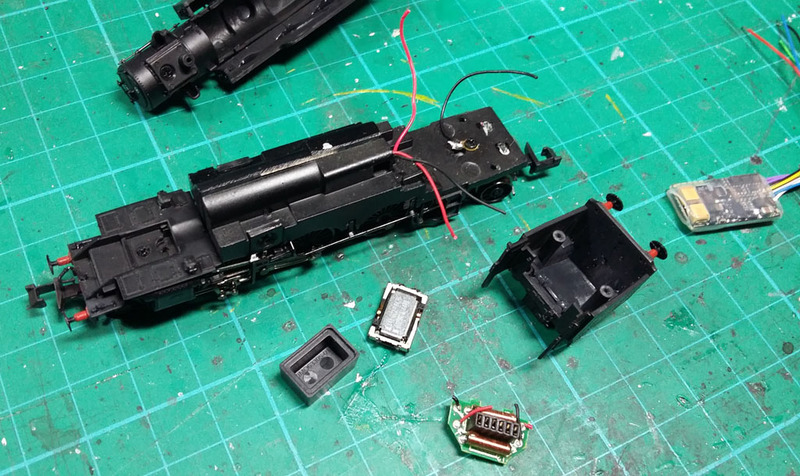 Main body back on, front screw in, and essentially all done!